Furtemba Sherpa, a 34 year-old Nepalese World Cyclist already has 71 countries’ national flags attached to his bicycle, each a memento of the countries he has been to. He hopes to complete 80 more countries by 2020. With about 90 kilograms of load on his bicycle, on the 4th of August, he will be paving his way through Africa from Egypt, Cairo and hopes to end his expedition after an approximate duration of 30 months in Libya, Tripoli. Since the beginning of his mission to save the environment and promote world peace, he has had supports and assistance from people from all over the world. On 23rd July 2011, with the help of his sponsors Nabin Sherchan and Mingmar Sherpa owner of Yeti Restaurant, Nepalese community, Sherpa community and various communities based in New York, a fundraiser was organized at Yeti Restaurant where they managed to raise a generous amount of US$9,600 out of which Pasang Lama a resident from Texas made a generous contribution of US$5,100. 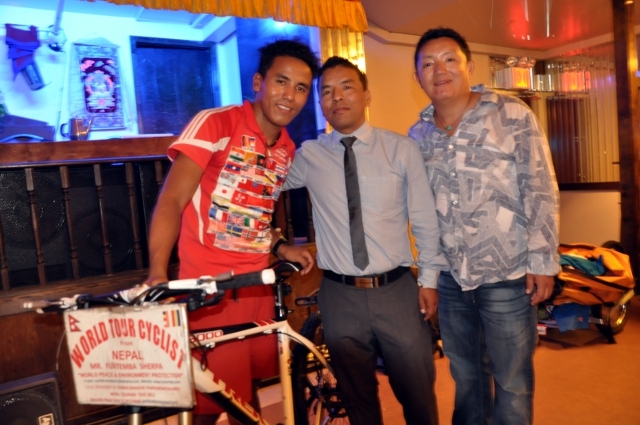 Besides money, Sonam T. Lama representative of New York Life Insurance kindly donated a brand new High Tech Bicycle valued at US$2,500 all for his tour to Africa. For the past six months in between his stay in New York, instead of wasting time idling he traveled a total of 2500 kilometers through Mexico, Texas, Oklahoma and Colorado. His stay in America was unintentionally extended with his passport failing to get renewed on time but now he is all set to start off his journey with a new set of camping equipments, protective gears and t-shirt among other stuffs for his tour to Africa with all the love and hope to make our world a better place. As Furtemba Sherpa continues his voyage to Africa, we wish him well, health and safe travel. He recently launched his official website shortly after Furtemba Sherpa Foundation was inaugurated in his honor. Follow him on his blog www.furtemba.org and be a part of his celebratory entourage as he completes the remaining half of his world tour. Furtemba Sherpa was featured as TexasNepal Personality of the Month for May 2011.